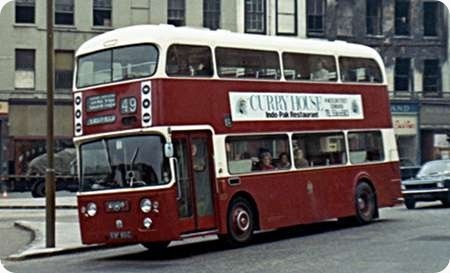 This photo shows Edinburgh Corporation 801 ESF 801C taken in 1967, 801 was the corporation’s first Atlantean with Alexander H74F bodywork delivered in February 1966,it was I think the first double deck body with panoramic windows and may have been exhibited at the 1965 Scottish motor show at Kelvin Hall which could explain it’s 1966 delivery. The next batch 802-825 EWS 802-825D with identical Alexander bodies were delivered in October 1966 had the then normal short window bays and these were delivered shortly after 826-850 EWS 826-850 which were Leyland PD3A/2’s with Alexander H70F bodies, canny Scots hedging their bets perhaps. Beauty is in the eye, as they say. The big window version of the Alexander ‘Y’ type, was arguably the best looking single deck Bus or D/P of its generation. However, as with the Southdown Queen Mary, for me the big window version of these just didn’t work. The NGT Group had a number of the small window versions, Newcastle Corporation had both large and smaller window types, they also had some rather strange large window types with the stairs on the ’ wrong’ side, and a centre exit. After a series of accidents, the union refused to use the centre exit, and as the vehicles were due for overhaul, the doors were removed and extra seats fitted. Centre exits seem to have been a passing fad of the late 1960s. What was the real issue with them, as they seem to be the norm in other countries? I’m aware from reading some of these postings that there were structural problems with some single deck dual door bodies. Or was the main thing that the unions didn’t like them, as Ronnie mentions? There were structural problems on double deckers as well. SELNEC had problems in later life with Mancunians. There were problems with accidents and the unions, in the interest of their members, took against them. Meant to reduce time at stops by having all passengers disembark at the centre door, all too often they didn’t and many tried to board there leaving the driver trying to collect fares, deal with any form of pre paid passes and monitor the centre door as well as keeping an eye on the seats remaining, in a difficult position. Multi doors work well elsewhere where either the bulk of fares are prepaid or there is a second crew member and where some form of load counting actually works – the technology of the time didn’t. Silly question, perhaps, but is it really a LEYLAND Atlantean? I ask because some for Scottish operators had ALBION badges, including Glasgow’s KUS607E which now resides at the St Helens museum. Yes this was definitely a Leyland Atlantean Pete as you can see the figure of Atlas on the badge whereas the Glasgow Albion badged Atlantean’s had the St Andrews cross in it’s place as can be seen on the attached photo of KUS 593E taken a couple of years later in central Glasgow. I seem to remember that the Albion badge on the Atlantean was a Glasgow only spec. Thank you, Dave and Phil! It could be that it was more efficient to send several chassis in kit form to be assembled at the Albion works in Glasgow, and then onto Alexander to have the body fitted, rather than one at a time in completed form, after all, the Alexander works was at Falkirk, which is not that far from Glasgow. At the end of the day, any differences would probably be down to badge engineering. The "Albion" Atlanteans supplied to Glasgow followed a batch of "Albion" PD3s. Leyland got the blame for deleting half the Albion range in the early 1950s after the Albion takeover, when in actual fact Albion were already in the process of doing just that when financial troubles caught up with them. The Albion badges were applied as a gesture to the Glaswegian population in an attempt to settle the ill-feeling. Edinburgh and Lothian stuck with dual doors into the low floor era. The Leeds dual door buses gave 15 plus years of service. In later years they found themselves in such esoteric locations as Ilkley and Skipton following the absorption of WYRCC by Yorkshire Rider. This unusual but nonetheless attractive-looking Guy Arab II was new in 1943 to London Transport as its G77 (GLL 577), and was originally fitted with utility bodywork by Park Royal. A Gardner 5LW engine provided the power. It was withdrawn from London service in 1952 and sold to Edinburgh C.T, who had the chassis rebodied by Duple/Nudd in 1953. As can be seen, it was given a full front and concealed radiator by the bodybuilder. However, the front nearside ‘windscreen’ and side window next to the bonnet were not glazed, probably as an aid to maintenance as regards access to the engine. Interestingly it was re-registered by ECT on rebodying. Could this indicate that the chassis was fully overhauled by ECT prior to the new body being fitted? The photo shows the vehicle in preservation, and isn’t that livery just beautiful? Thanks for posting, Brendan. I’ve not yet seen this vehicle "in the flesh" since I started photographing buses, but I do recall seeing other Edinburgh vehicles with the strange feature you mention. I think the others were Leyland Titans. My knowledge of Nudd Bros as a bodybuilder is practically zero but the one useless piece of information that I do recall is that Mrs. Nudd was formerly a Miss. Mabel Barton whose father was not exactly unknown in the bus world. In an era when there was still a shortage of buses, London Transport were forbidden from selling surplus buses to BET competitors, a ridiculous restriction. So, apart from many going abroad, the largest single other purchases were 100 Daimler CWA6’s to Belfast Corporation and 60 LT austerity Guy Arabs were bought by Edinburgh Corporation buses, I think, for tram replacement. They were given fleet numbers 301 to 360 (JWS 581 to 640). Leyland-style glass-fibre fronts replaced the originals when they were overhauled in 1959. Most of them lasted until the late 1960’s. I wonder if the registrations were changed just for the sake of having Scottish ones. There were sixty of these buses, purchased to enable the Edinburgh tramway system to be abandoned within very tight budgetary constraints. London Transport wanted to get rid of all its utilities as soon as possible. The Guy Arabs, many of which had crash gearboxes with the “wrong way round” (upwards from right to left) gear selection, were the least popular of the four utility types in the fleet. The unfrozen TD7 STDs were pretty unpopular with drivers too, but there were only eleven of these buses compared with 435 of the Guys. Understandably, LT wanted to get the best price possible for these quite young machines of relatively low mileage, but the British Transport Commission, to which LT had to accede, stipulated that no BTC vehicle disposals were to be sold outside the group, unless for export or non psv use. This was a time of an ascendant public transport industry, and the BTC’s paranoia in respect of independent and even municipal operators surely cried out for some Freudian counselling. The LT Bristol Ks were passed on painlessly to Crosville, Lincolnshire and Brighton, Hove & District, and the Daimler D fleet, with preselective gearboxes and, for the most part, AEC 7.7 engines, could be kept a bit longer, but the Guys posed a problem. The Scottish Bus Group would certainly take some, but no other market within BTC existed. Several did go for export, but many ended up languishing in Cohen’s scrapyard at Feltham. Determined to get a better price for its Guys, LT turned to W. North of Leeds, who became the main purchaser of ex London buses for several years. Under pressure from all sides both within and without the bus industry, the BTC finally relaxed its embargo on sales outside the group in December 1952. However, before this, in November 1951, Edinburgh Corporation approached Guy Motors with a proposal to purchase 60 ex LT wartime Arab chassis that Guy would renovate and update for rebodying. Entirely happy to comply, LT found itself up against the BTC rule, but, not wishing to lose such a satisfactory unit price for these Guys, LT approached James Amos of SBG to intercede on its behalf. Despite being in different ownership camps, the SBG and Edinburgh Corporation had a harmonious relationship, particularly as Scottish Omnibuses stood to take over the Musselburgh tram route when it was abandoned. The ploy succeeded, though the buses were sold direct to Edinburgh, not via Guy Motors, on the strict understanding that they were to be scrapped when Edinburgh had finally finished with them. Edinburgh’s engineers were permitted to pick their own vehicles from the withdrawn fleet, and collected their chosen sixty from Edgware garage in April and May 1952. The bodies were removed and scrapped, and the chassis were overhauled and updated to such an extent that they were given new chassis numbers, and hence new registrations. The Gardner 5LW powerplant was retained, though 314 received a 6LW in 1963. New Duple H31/25R bodywork of lightweight construction was ordered, though the major part of the work was undertaken at Nudd Bros and Lockyer in Kegworth, Leicestershire, later to be renamed Duple Midland. These bodies were of a truly spartan specification, to be emulated later by the early examples of the MCW group Orion. The complete vehicle weighed only 6tons 14cwt 1qtr. No opening windows were originally provided, and the apparent full front lacked glazing round the bonnet, possibly to improve engine access, but equally probably to save weight. Originally, the front panels had a set of horizontal polished strips, but in 1958/9 a glass fibre front panel visually similar to the standard Leyland tin front was fitted. Opening windows to the saloons were provided at the same time. To be pedantic, the solitary preserved Arab above – Edinburgh kept its promise to scrap these buses upon their withdrawal between 1967 and 1969, and only No. 314 survives – has the original form of shiny stripwork applied over the later extended Leyland clone bonnet for its 6LW, and is thus not entirely accurate, but this is a minor point. It is good to see this preserved example of a truly remarkable fleet of buses. I must acknowledge that the bulk of this detail has been gleaned from Ken Blacker’s excellent comprehensive book “London’s Utility Buses” (published by Capital Transport). Nudd Brothers and Lockyer, were originally based at a small workshop in Chilwell, Nottinghamshire which was opposite the R.E.M.E 38 Central Workshop. Thx, Roger, for fleshing out my more meagre story of LT’s dilemma in selling perfectly good buses (well chassis at least), but many had had their bodies ovehauled or had sound NCB-bodied Guys. I do recall that 314 was due to be converted to a tree-lopper and skulled around for some time waiting for it to be done. In the end, it never happened and the vehicle went for preservation, happily, for the story of these buses, especially 314’s, is really unusual and interesting. For anyone with an interest in Londons utility buses, I really must recommend the Capital Transport publication by Ken Blacker. "Londons Utility Buses". It is an absolute gem, full of detail, superb photographs, and disposal references, and is a must for all who loved the "utilities" in any fleet! Alan Townsin’s TP book, "The Utilities", is, of course, the complete reference work. I have been searching, but to no avail, for details of Edinburgh’s other utility rebuilds, with Alexander bodies. I believe these were all Daimlers, some of the CWG5 variety, but seem to remember reading that some were CWA6, and that they were "Gardnerised" upon rebuilding. This was, if correct, a most rare occurrence! Can any of you experts throw any light on this happening, or is my memory finally collapsing?! Am I correct in thinking that some of these were sold to the SBG and were lengthened and given saloon bodies or did I dream it? S.M.T did indeed rebuild utility Guys ex London Transport into 30ft single deckers. S.O.L. dismantled 23 ex London Transport Guy utilities. Each chassis was lengthened to 30ft and rebodied, 17 with S.O.L. B39F bodies and 6 with S.O.L. C35F bodies. As with the Edinburgh vehicles they were re-registered JWS 122 TO 131, KSC 918/919 and LSC 91 TO 101. 5 bus bodied vehicles went to S.O.L and the remainder to Highland Omnibuses. 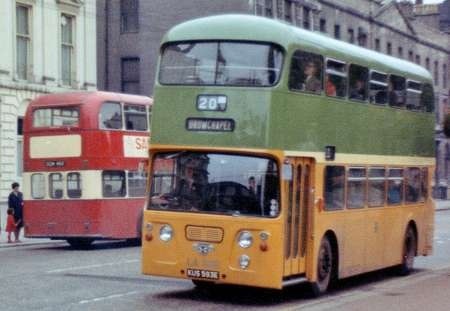 Also the first two vehicles rebuilt for Edinburgh received Duple bodies. Western S.M.T also rebodied a number of ex London Transport Utilities. As with the Edinburgh and S.O.L. vehicles they were reregistered. This information came from my own records and also from a recent publication by the PSV Circle about Guy Heavy Chassis. Stephen, I wasn`t aware SMT had body building facilities. Are you sure this work wasn`t done by Alexanders? S.O.L constructed the bodies at their Marine Works using Alexander frames. Marine Works subsequently became part of Scottish Bus Group Engineering in 1985. Marine Works also constructed 32 Duple Vista style bodies on to Bedford OB chassis. 20 of these vehicles were subsequently rebodied by Burlingham. The same works also constructed 60 Bedford OWBs to a design very similar to Duple. 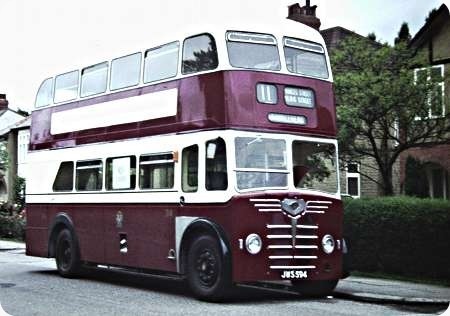 In 1955 S.O.L also bodied a single decker using Albion Claymore parts. Fleet number S1 LWS 926. Didn’t SMT also build utility bodies on Bedford OWB chassis during WW2? I think they were undistinguishable from the Duple and Mulliner versions. David, Alan Townsin’s book on Duple doesn’t quite agree with your history of Duple Midland. Nudd Bros & Lockyer were the original Duple Midland, but they were at Kegworth, not Loughborough. New premises in Loughborough were obtained by Duple, and the operation was in the process of gradually moving there when Willowbrook were acquired, making three Midland factories in all. Rationalisation (largely glossed over) eventually resulted in only the Willowbrook factory remaining open, using Duple (Midland) as a badge name for some products. There is no mention of Yeates at all, and I have no reason to believe they were ever involved with Duple; as I recall it they simply stopped building bodies and remained as a dealer. As I’ve said before, Peter, when you provide a thumbnail you provide the opportunity for mis-reading or mis-interpretation. Your accurate reading of Alan Townsin’s book doesn’t substantially disagree with my thumbnail. As for Yeates. I only recently discovered that myself – but cannot for the life of me find the source. They "closed" in 1964 and it could be a case of the "NCBs". The Yeates company didn’t fold, they just closed the coachworks. When NCB did fold, the machinery and an amount of timber were sold to C H Roe. Possibly the same happened with Yeates – selling machinery and parts to Duple (Midland)/Willowbrook. Thanks for this, Stephen. The link goes to the archive home page, but the issue in question is 4th October 1963. Duple took over Yeates body works (next door to Willowbrook) but not the staff, and agreed to complete outstanding work and continue to service and repair Yeates coachwork. I’m surprised the Duple book doesn’t mention this. My fault that. Link fixed. Roger, I had no idea of the spartan and lightweight nature of the Duple/Nudd-bodied Guys. The fully-fronted styling and ornamentation around the grille give the impression of something ‘a cut above’, whereas in reality it sounds like, as my late Grandma would have said, a case of "all outward show". Sadly, as you mention, ECT persisted with this back to basics policy and followed on with the infamous Orion-bodied Titans. At least the beautiful livery was retained as a saving grace. David O, thanks for clarifying the situation re Duple, Nudd, Willowbrook, Yeates and Burlingham. As you say, it did get a bit complicated. Willowbrook’s quality certainly was suspect, following its sell- off. West Yorkshire were to have taken delivery of fifteen Willowbrook coach-bodied Leyland Leopards in 1981, but in the end only received six (2594-99). They were not well received, and passengers complained that the seats were very uncomfortable, especially on long-distance journeys. The overall finish appeared cheap and cheerful when compared to Plaxton’s products, and the Willowbrooks were soon down graded to dual-purpose vehicles. The remaining nine Leopard chassis were temporarily stored for some months at WY’s Harrogate depot, as Willowbrook were experiencing a backlog of work and hadn’t room to store them. The chassis were later despatched to Duple for bodying, becoming WY’s 2600-08. What a sad end for Willowbrook, and who would have guessed that Duple would eventually close its doors some years later? Duple was a national giant when Plaxton was still a local upstart in the early fifties. At the same time Silver Service Darley Dale were receiving Regal IVs with Willowbrook coach bodies and a little later Black & White Motorways received slightly more modern versions of the same body on Reliances. These were full blown coaches – as were the later Viscount and Viceroys – and ranked among close seconds to Burlingham’s Seagull for style. [These were also Willowbrook names before Duple hi-jacked them.] Yes Brendan, with Duple and Willowbrook both, how are the mighty fallen.